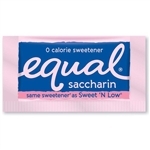 You'll find sweeteners as an alternative to sugar in every restaurant and food service environment, and we carry all the popular brands you know including Equal (pink, yellow and blue), Sweet N Low, Splenda, and some with which you may not be so familiar like PureVia, Monin and Luzianne TeaSweet. You have the choice of a variety of product bulk sizes as small as single-serving packets of 0.04-ounces (2000 one gram packets) and as large as one liter (4 per case) and 32-ounces (6 per case). Select from artificial sweeteners and sugar substitutes made from aspartame, saccharin or sucralose, or try the Equal Smart Pack, which contains a collection of all three. Stratas Foods Equal Pink Single Serve Packets Sweetener 1 Grm. Stratas Foods Equal Yellow Single Serve Packet Sweetener 1 Grm. Sweetener Purevia Single Serve Packets Green - 0.04 Oz. Luzianne Tea Sweetener - 32 Oz. Sweetener Purevia Bulk - 16 Oz. Truvia Natural Sweetener Spoonable - 9.8 Oz. Buy your wholesale Sweetener Packets from the leader in restaurant supply.